This page has been viewed 43 times this month, and 1665 times total. 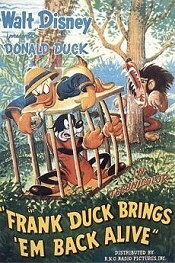 Cartoon Characters: Goofy, Frank Duck (Donald Duck), Lion. Voice Actors: Clarence 'Ducky' Nash, Pinto Colvig. Animated By Hugh Fraser, Jim Moore, Al Coe, Andy Engman. Originally Released on November 01, 1946. 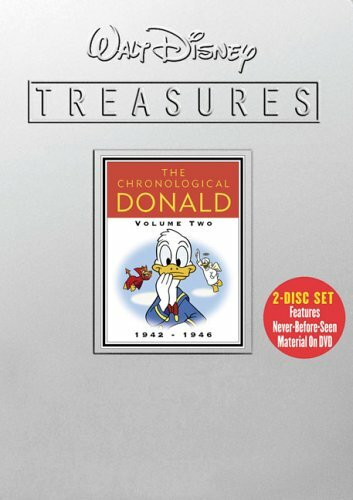 In a switch from "Tiger Trouble" and "African Diary", this time Donald plays the great white hunter, going after the "wild man of the jungle", Goofy. Goofy's ending theme is used at the end of this cartoon. You can watch this cartoon today on your computer. Just click below to start viewing "Frank Duck Brings 'Em Back Alive" online now. Do you have anything to add to this page? Have we made any mistakes... or do you have any additional information about Frank Duck Brings 'Em Back Alive? If so, we would love to hear from you. Please send us a quick note with your additions or corrections to this page, and we will make the corrections as soon as possible! Do you love Frank Duck Brings 'Em Back Alive, or do you think it is the worst cartoon ever? Let us know what you think! Surely you have an opinion... so share what you think. Take a minute and post your own comments about this cartoon here. Frank Duck Brings 'Em Back Alive by Big Cartoon DataBase is licensed under a Creative Commons Attribution-NonCommercial-ShareAlike 4.0 International License.